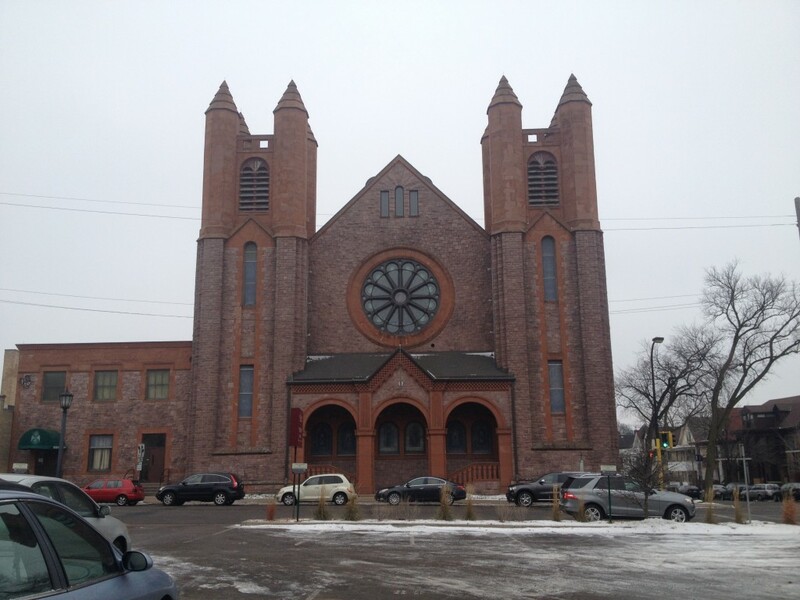 Exploring the Twin Cities, one notices there is an abundance of beautiful and unique churches to be found. This isn’t surprising, given the history and population of the Minneapolis/St. Paul metro area. Narrowing this week’s list down to the following churches was a mighty struggle, because each attempt to research more of them uncovered dozens upon dozens of different ones. Here is the top 20 List of Highway Highlight’s favorite churches in the Twin Cities of Minneapolis & St Paul. 20. 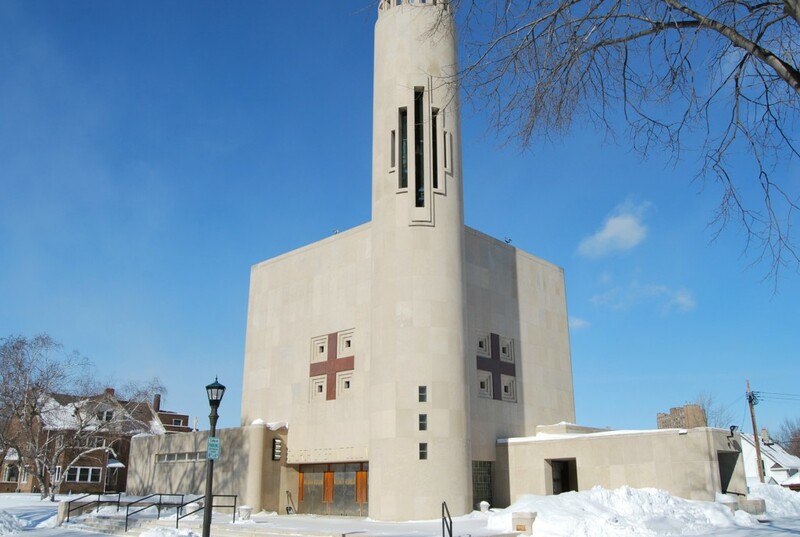 Our Lady of Lourdes Catholic Church, NE Minneapolis – This classic little Catholic Church on a hill near the Mississippi River holds the distinction of being the oldest continuously running Catholic church in Minneapolis. Its construction dates back to 1854-57 and its architecture is a mix of Greek Revival and Romanesque. It’s small, sure, but it is also quaint, historic, and beautiful. Visitors travel from all over the suburbs to attend services at this pretty little house of worship. 19. Mt. 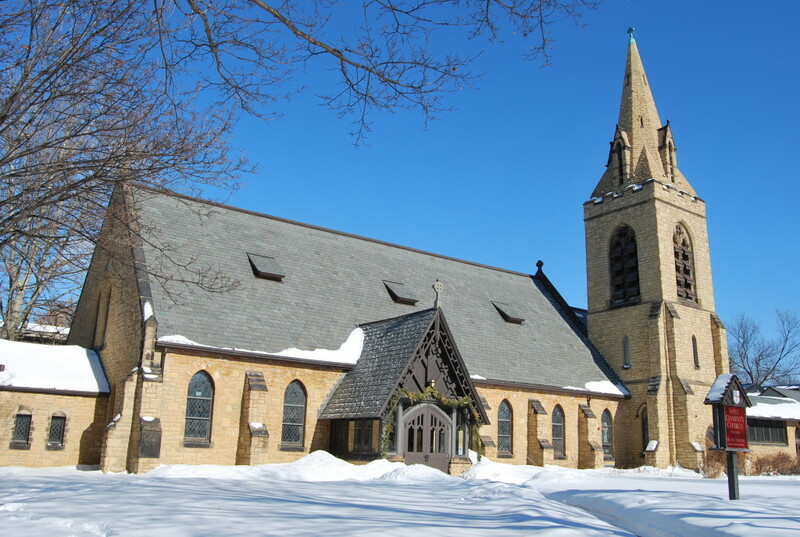 Olivet Lutheran Church, Minneapolis – Mount Olivet Lutheran Church in southwest Minneapolis, which prides itself on a staggering 13,000 members, is the world’s largest Lutheran congregation. Think about that for a second. The church structure dates back to 1923, but the parish started a few years before that. It can seat 2,775 people at one time. The architecture is English Gothic Revival in nature. 18. 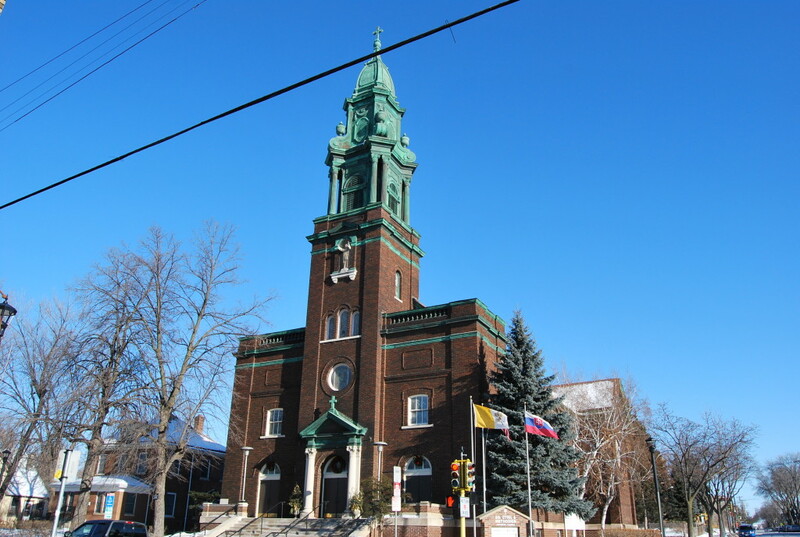 Saints Cyril & Methodius Catholic Church, NE Minneapolis – The Arts District of Northeast Minneapolis is home to many beautiful churches and a history of working-class, turn-of-the-century Minneapolis settled largely by Germans, Polish and several other immigrant groups. Saints Cyril & Methodius Catholic Church is a great example of classic Renaissance architecture and dates back to 1917, with the congregation actually forming previously in the 1890’s. The copper steeple, now green with patina, and the squared-off angles of dark brick give it a bold, distinct look. 17. Ft. Snelling Veterans Chapel, Fort Snelling, Minneapolis – Fort Snelling, a former military-outpost-turned-state-park, is home to a pretty little chapel on its grounds that was built in 1927, as a result of a request made by Sunday school children in 1924 to have a post chapel. When the military base was decomissioned in 1947, the chapel was scheduled for demolition as the highway system was coming through. Thankfully it was not, and it stands today used for weddings/funerals, tours, and a non-denominational weekly Sunday service. Its rounded tower is a nod to the Round Tower of the original (and still-standing) Fort Snelling stockade, and it houses memorials to veterans and other military history. 16. Plymouth Congregational Church, Minneapolis – This church’s parish dates back to 1857 with a small church erected near where the current one stands, just south of downtown on Nicollet Avenue. However, the after a fire destroyed the first one and the next one was outgrown, the Plymouth Congregational Church that you see now was constructed in 1907 using mostly granite quarried in St. Cloud. The architectural style is English Rural Gothic, and several additions were made to it in later years. 15. 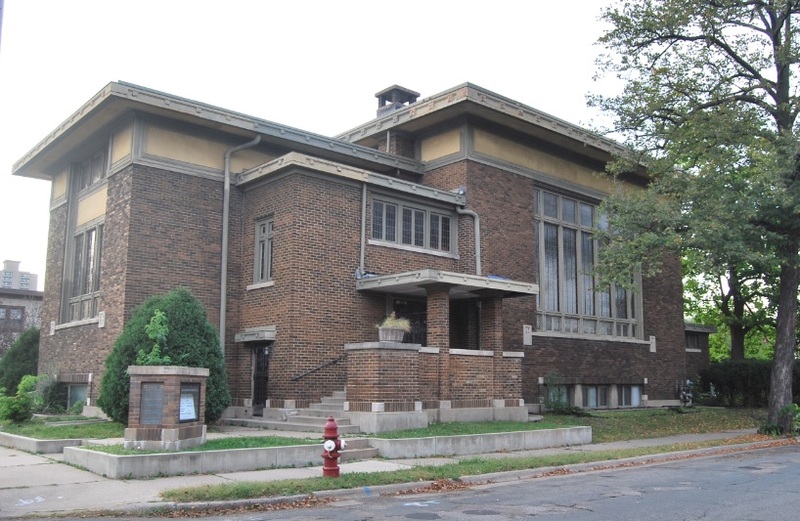 Calvalry Baptist Church, Minneapolis – The Calvalry Baptist Church was designed by architect Warren Hayes, a leading Minneapolis church architect of the late 1800’s, who also designed churches #11 and #7 on our list as well as the Fowler Methodist Episcopal Church (Honorable Mentions). 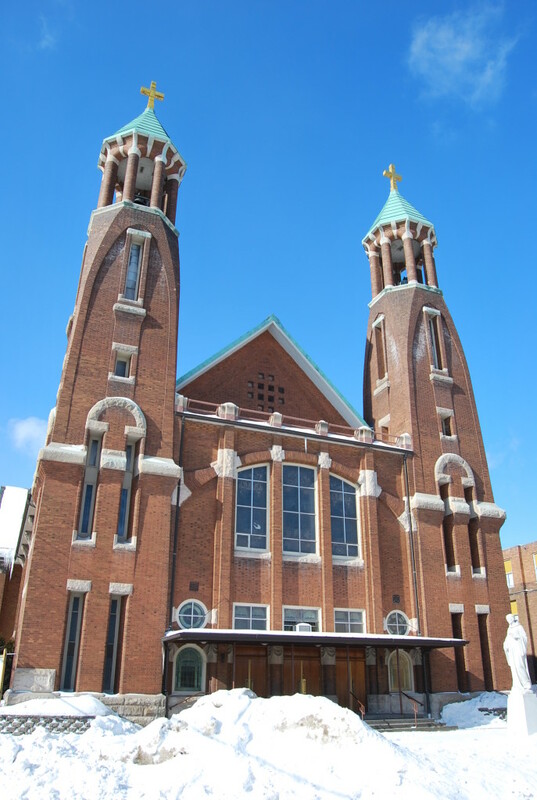 A great example of Romanesque architecture, with arched windows, a dark-brick facade with squared-off steeples and turrets that were a common theme of these churches built around the turn of the century. This one, dating back to 1902, is emblematic of the historic Whittier neighborhood of Minneapolis. 14. Westminster Presbyterian Church, Minneapolis- This stately church in downtown Minneapolis is the third church of this parish, built in 1897. 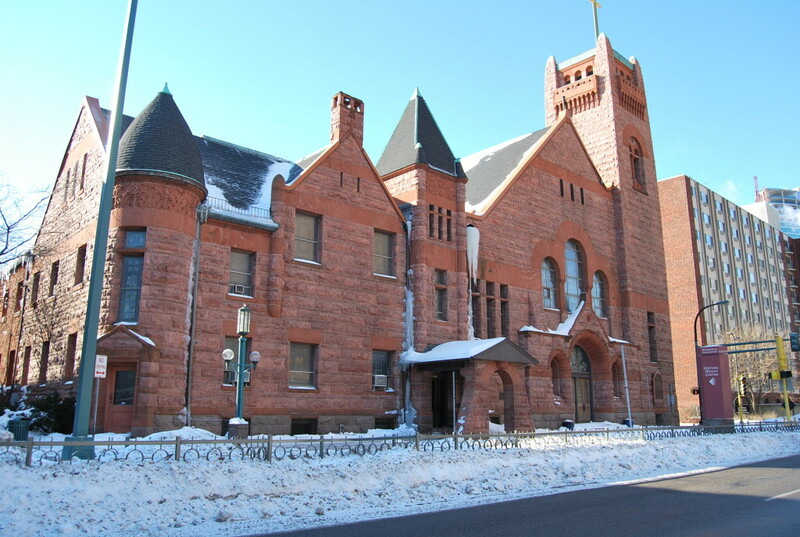 It’s home to a large congregation of Presbyterians in Minneapolis, and is known as a local landmark. It was listed on the National Register of Historic Places in 1998. It features a mix of Gothic and Romanesque architecture with large, square steeples and rounded stained-glass windows. In 1998, $3.5 million was sunk into its interior to restore its design elements and maintain its structural integrity. It remains of downtown Minneapolis’ most recognizable churches. 13. Hennepin Ave United Methodist Church, Minneapolis – Unfortunately I wasn’t able to grab a better photo of this building but the day I visited it was well-below zero and parking around the church is difficult. Anyhow, the Hennepin Ave United Methodist Church in Loring Park in Minneapolis has a most unique look to it; the tall, pointy spire jutting out from its center and English Gothic architecture are based on the Ely Cathedral in England. At one point it was the second tallest building in Minneapolis. 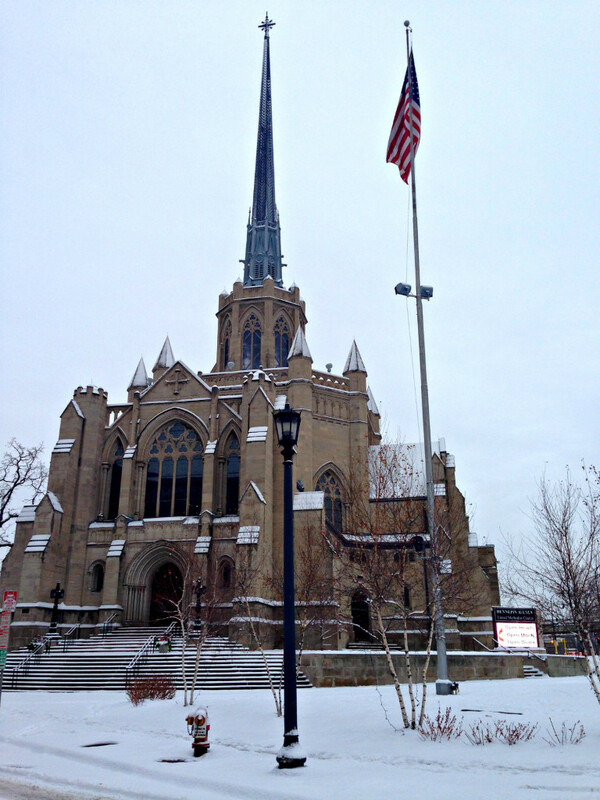 It sits near the Basilica on the very busy intersection of Franklin and Hennepin. It was built in 1916. 12. 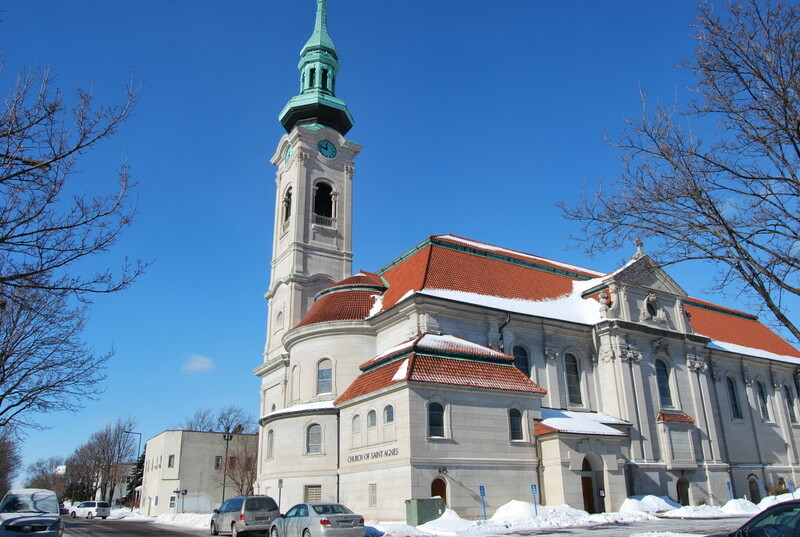 Church of St. Agnes, St. Paul – The Baroque-style architecture of #12 on our list is highlighted by the 206-ft steeple topped with a copper dome now faded green. The limestone exterior with red clay tile roof give it a distinct look, reminiscent of churches in central Europe from the Baroque era. Rightfully listed on the National Register of Historic Places, the Church of St. Agnes was completed in 1912, and part of the rectory of the church was damaged by a bomb in 1917. The bomber blamed it on an act of hostility towards German priests. The church stands in a residential neighborhood north of downtown St. Paul. 11. 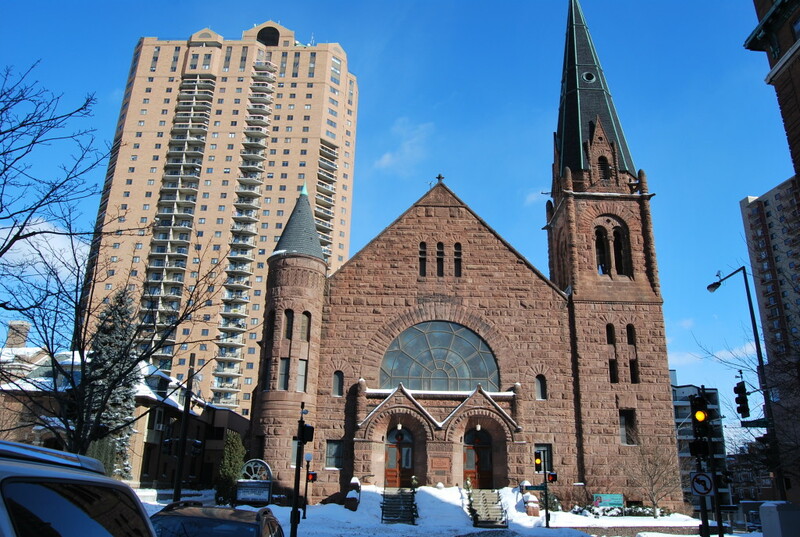 Wesley United Methodist Church, Minneapolis – Found in the Loring Park area of Minneapolis on the edge of downtown, the Wesley Church displays Romanesque architecture built with red sandstone and granite and features turrets and a square steeple. 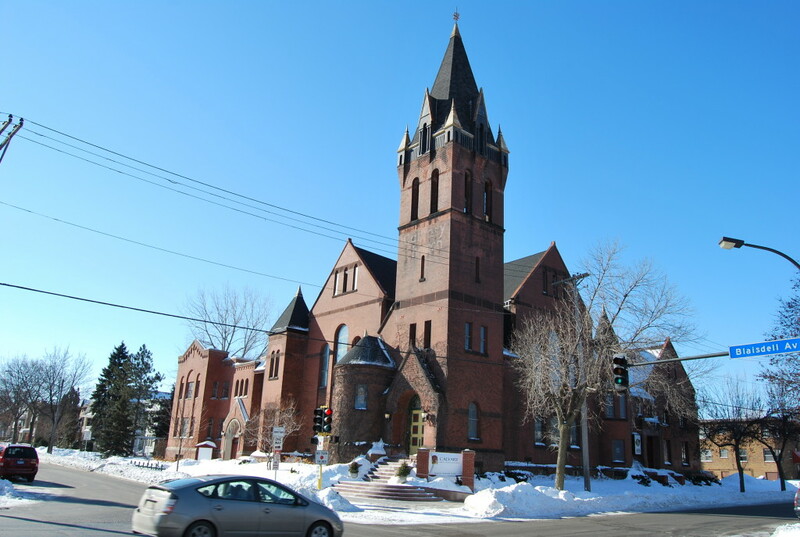 It was built in 1891 and is referred to as “the Mother Church of Minnesota Methodism.” It was listed on the Preservation Alliance of Minnesota’s List of Endangered Historic Places in 2010, meaning its future is mostly uncertain but it will not go down without a fight. It currently has no congregation and sits largely unused. 10. St. Louis Church, downtown St. Paul – Although this church is now dwarfed by the surrounding skyscrapers, its Renassiance/Baroque-style architecture with twin towers and tan brick facade still earn the St. Louis Church a place on our list. The parish began in the 1860s, with several churches coming and going before this current structure was built in 1911. The architect who built it, a native of France, often used this design style in his churches. St. Louis Church is often referred to as “the Little French Church,” due to the architect’s affinity for it being his favorite. It’s one of ours, too. 8. Church of St. Columba, St. Paul – This interesting church, found in an unassuming residential St. Paul neighborhood, is the only church on our list to feature French Norman-style architecture. The curious structure features a round, concrete steeple and square angles built with Indiana limestone. The interior is very detailed and beautiful, as seen here. This Christian church was built in 1950 and its parish history dates back to 1914. It is tucked into a neighborhood near the Midway area of St. Paul and just seems too quirky and unique to be hidden away like that. 7. 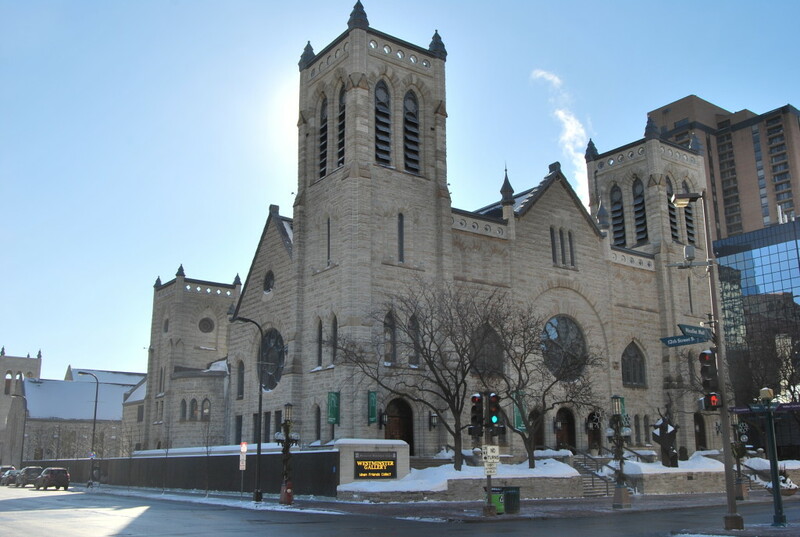 Central Presbyterian Church, Downtown St. Paul – Situated right next door to number 10 on our list, is the Central Presbyterian Church Built with Lake Superior brownstone, it features a large, circular stained-glass window, a turret on the left, and its grand steeple flanking the right. Another Warren R. Hayes design, it exhibits Romanesque architecture common of the late 1800’s. 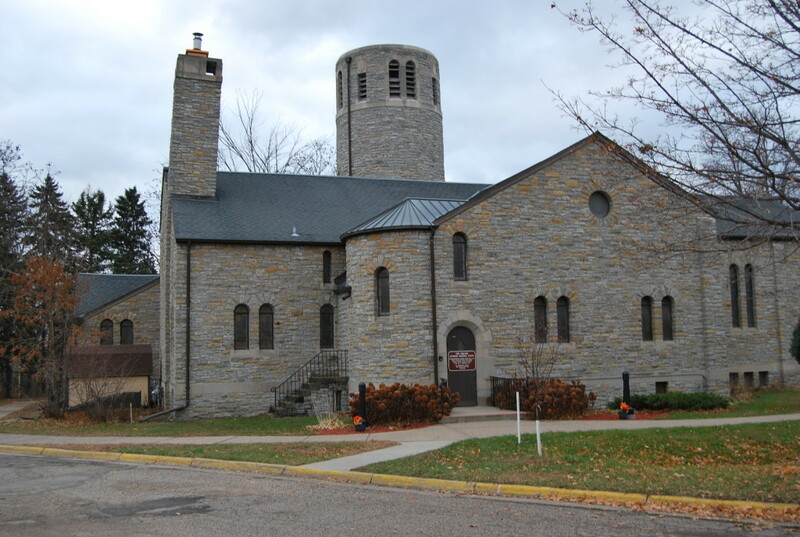 The parish history started in 1851 when the population of St. Paul was only 1500. Several structures were built and replaced, with this final number being constructed in 1889. It is listed on the National Register of Historic Places. 6. 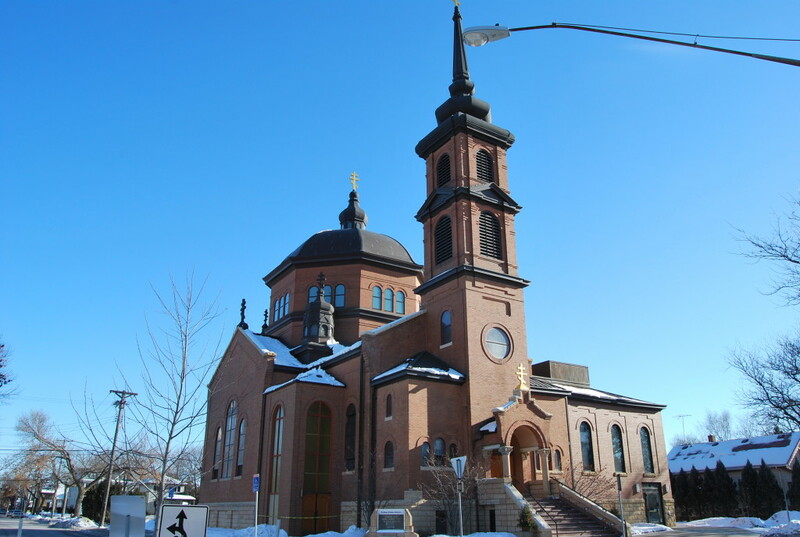 St. Mary’s Orthodox Cathedral, NE Minneapolis – Our second entry in the Arts District of NE Minneapolis is a church whose design is based on the Omsk Cathedral in Russia. Its history can be traced to the Carpatho-Russian immigrants who arrived to Minneapolis in the 1870’s. The brick structure took many years to build due to lack of finances, but once it was completed it has continually run as an Orthodox church, an offshoot of the traditional Catholic Church. It features Ukrainian Baroque architecture with a black sanctuary dome and copper spire on top of its steeple. 6. 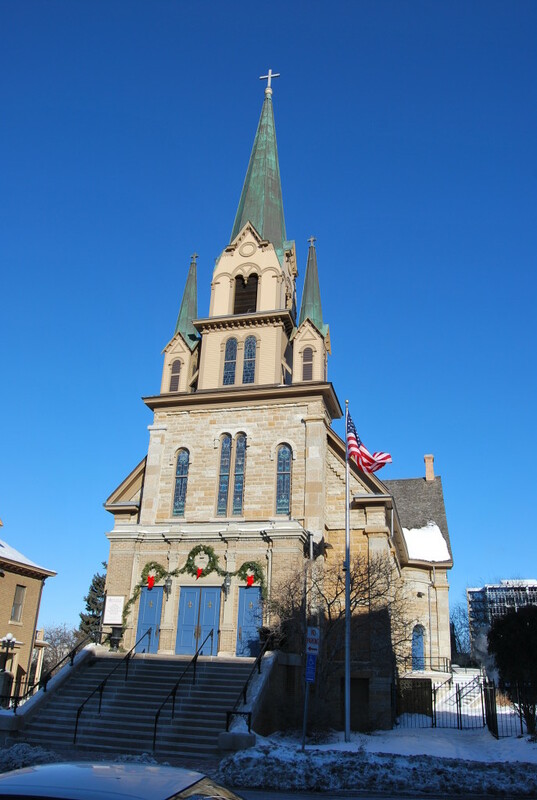 Church of the Assumption, Downtown St. Paul – Assumption Parish started in 1856 when German Catholics separated from the nearby Cathedral parish. They built a small church and school and quickly became the largest Catholic parish in MN. A new church was needed, and in 1874 the church pictured above was built. Featuring twin steeples, one with a clock tower and the other with church bells, as well as Romanesque architecture and limestone brick, the impressive structure boasts an equally amazing interior (see photos here). 5. 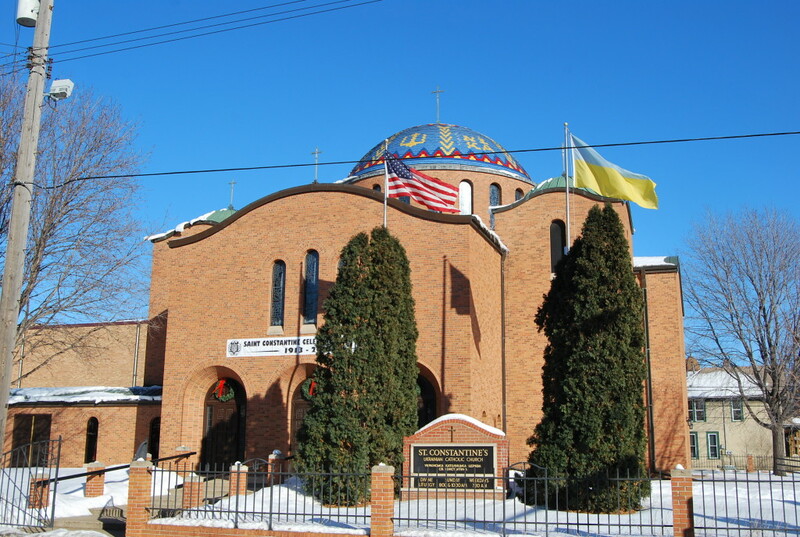 St. Constantine Ukrainian Catholic Church, NE Minneapolis – Probably the most interesting church in Northeast Minneapolis’ Arts District is St. Constantine’s Ukrainian Church. An example of Byzantine-inspired architecture, its main highlight is its central dome on top, a mosaic design of blue, yellow, and red. Immigrants from the Ukraine in Minneapolis date back to 1878 and have always had a presence in this part of the city. Their roots as a Catholic parish here date back to 1912, where the original church was located (and a school thereafter). However in 1970 a newer, updated church was built that still stands today. 4. 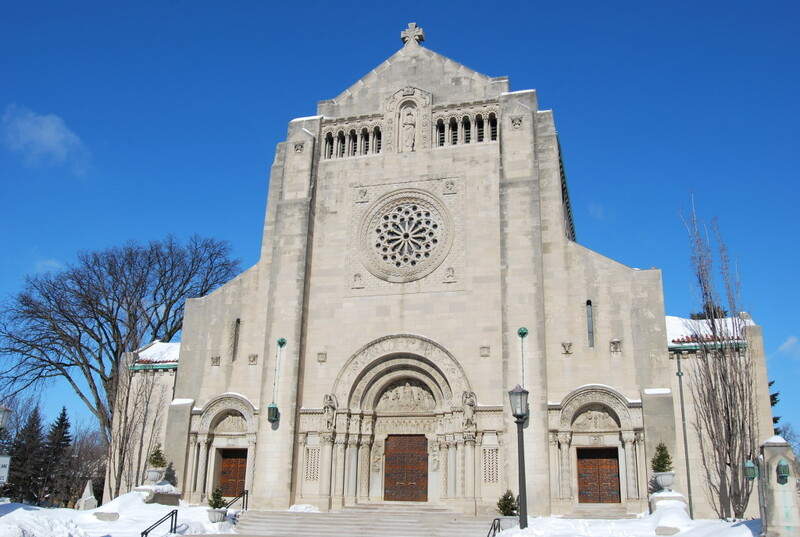 St Thomas More Catholic Church, St Paul – Located on Summit Ave, a street in St. Paul lined with impossibly beautiful and historic buildings such as the Governor’s Mansion, James J Hill House, and the Cathedral, St. Thomas More Catholic Church fits right in among the standouts. Classic Romanesque Revival architecture with arched windows and a broad, flat steeple make up the exterior with bold, heavy doors and limestone brick. This church is large and imposing, emblematic of St. Paul’s rich history. 3. 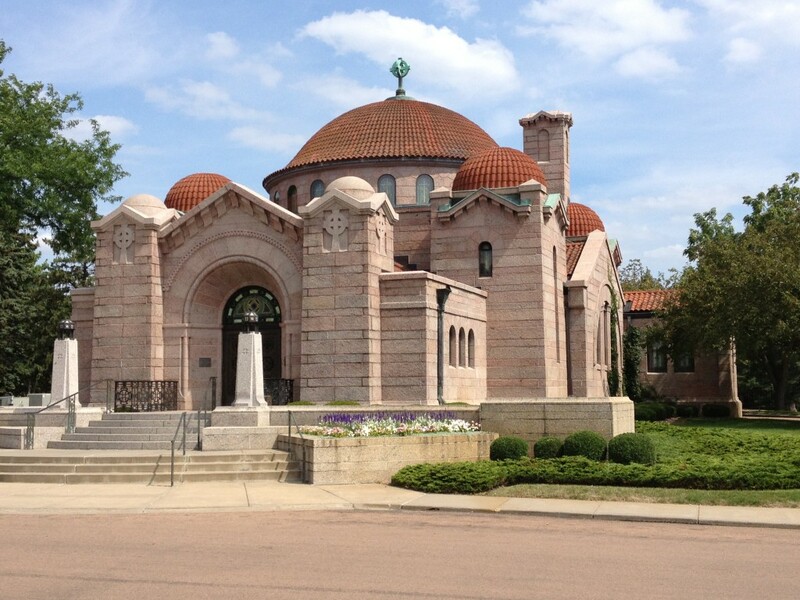 Lakewood Cemetery Chapel, Minneapolis – Located inside of Lakewood Cemetery, the ever-beautiful Memorial Chapel was built in 1910 and modeled after the Hagia Sophia in Istanbul, Turkey and serves as the architectural focal point of the cemetery. Its chapel dome is 65 feet high and ringed with stained-glass windows that serve as a sundial telling the time of day and season. The interior also features a mosaic made of marble, colored stone, and glass fused with gold and silver. It’s Byzantine-inspired architecture is rarely seen in Minnesota. 2. 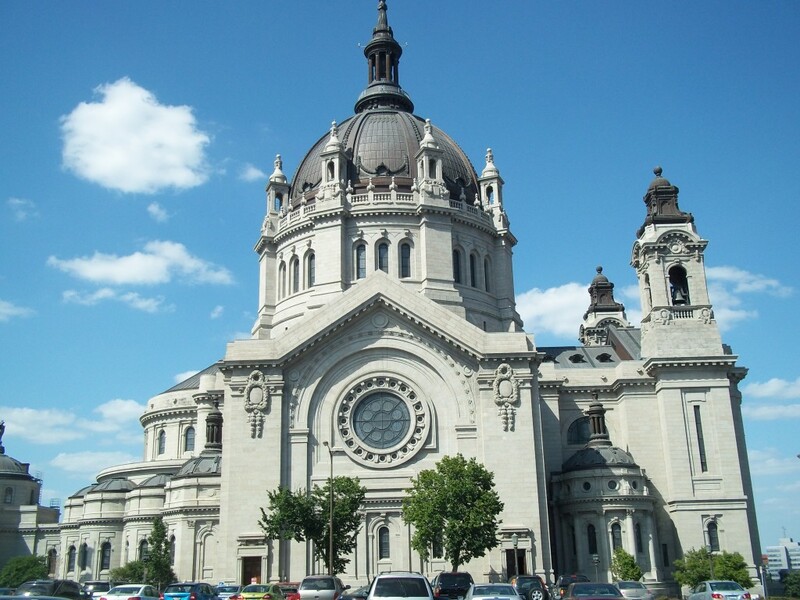 Basilica of St. Mary, Minneapolis – This Minneapolis landmark church was built in the early 1900s and displays examples of Baroque and Beaux-Arts architecture. The inside is incredibly ornate and wonderfully detailed, as one would imagine, and the Basilica holds a music festival on the grounds each summer called the Basilica Block Party as a fundraiser for the structure and local charities. There is no question it would be placed this high on the list, rivaling only one other church across the river. 1. 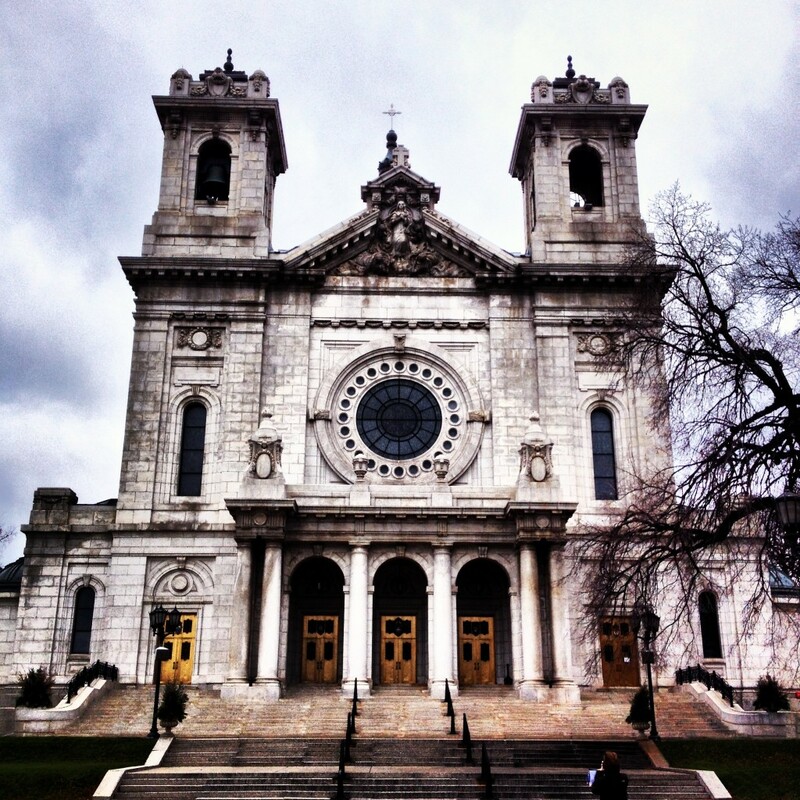 Cathedral of St. Paul – It shouldn’t come as a big surprise that this incredible work of art comes in at number 1. This is in our opinion, the most beautiful building in the entire state. It’s massive, one of the largest cathedrals in the country. The ornate, Renaissance-style design was influenced by French cathedrals, and the incredibley detailed interior is spellbinding, even if one is not religious. It was built over the course of about 7 years and was completed in 1914. It is situated on the top of a bluff overlooking St. Paul and is an iconic piece of Minnesota history. 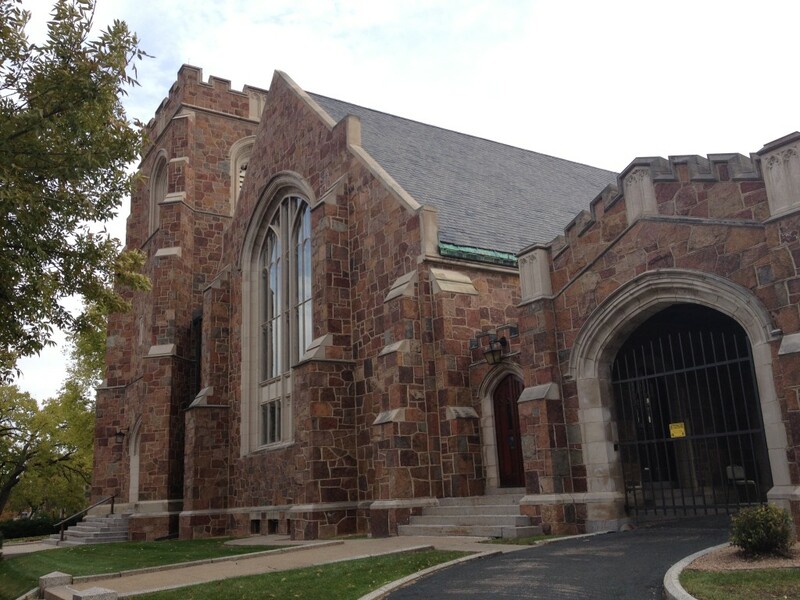 So there you have it, our list of the top 20 coolest-looking churches in the Twin Cities. I would have loved to have more time to view the interiors of them but most were locked when I visited. And I will probably find more that I missed and have to make an addendum to the list like I did with the coolest buildings of the Twin Cities. 1. St Bernards Church (St Paul): An Art Nouveau styled church in residential St. Paul featuring twin steeples topped with green, conical caps. 2. Fowler Methodist Episcopal Church (Mpls): Romanesque-designed twin square steepled church designed by famous church architect Warren H. Hayes, built in 1894 in the Lowry Hill neighborhood of Minneapolis. 3. 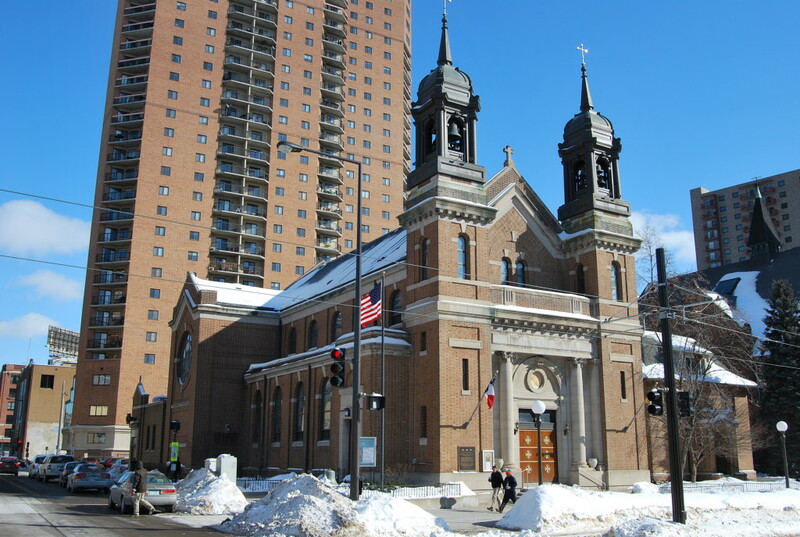 St. Clement’s Episcopal Church (St Paul): This church began as a mission church in 1893 and the structure was built in 1895. 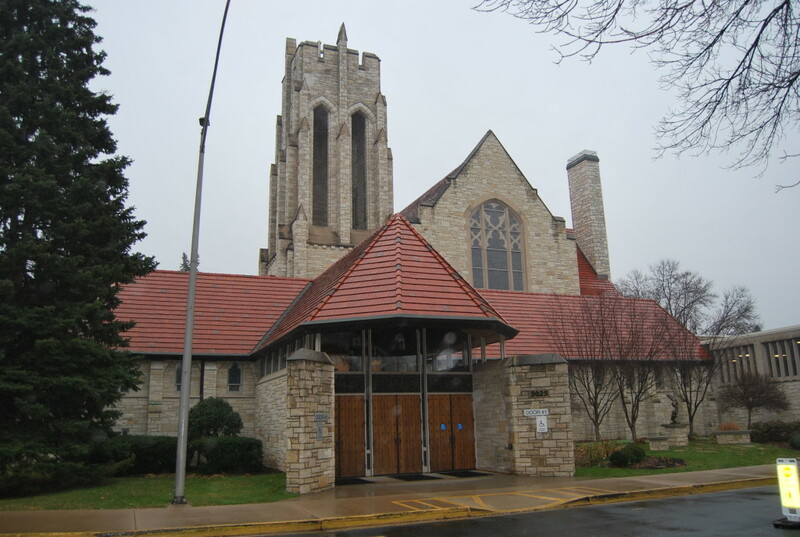 Designed with English Gothic architecture, it is now an Episcopalian church near Summit Ave.
4. 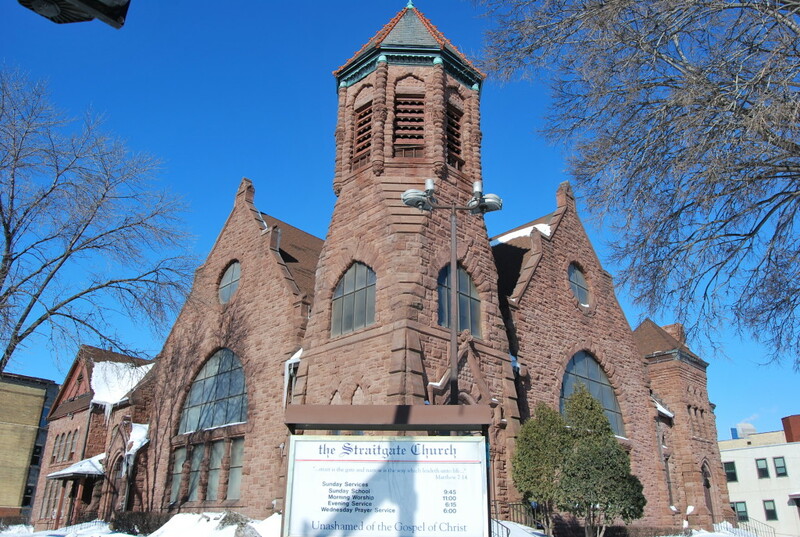 Redeemer Missionary Baptist Church, Minneapolis – A classic”prairie-style” church tucked away in a residential South Minneapolis neighborhood dating back to 1909 which is listed on the National Register of Historic Places. Church of Scientology, St. Paul – We don’t claim to know much about this “religion” nor its teachings. We’re not here to judge. And it’s certainly a nice-looking structure. But in terms of a church building, this thing looks more like the facade of a modern art museum or a theater or something. We’ll pass. You May Also Like: Top 20 Coolest Buildings in the Twin Cities , Top 10 Coolest Towns in Minnesota, Top 10 Coolest Churches of Stearns County, MN, Top 50 Coolest Houses in Minnesota. I think that one will be on the “addendum” to the list I will have to inevitably make…. Once a Bennie always a Bennie! 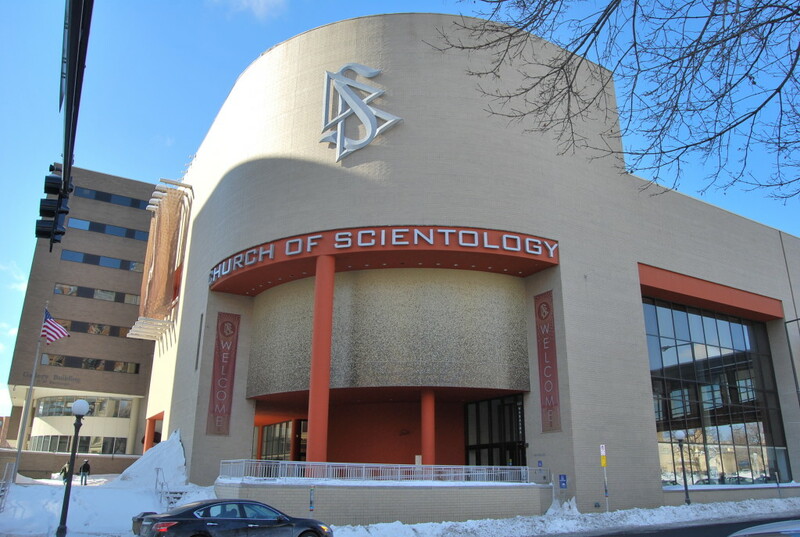 I assume someone has pointed out that the Church of Scientology in St. Paul that you said looked like an art museum was in fact the former home of the Science Museum of MN before it moved to its grand new home on Kellogg Ave.
Jeff, thanks for pointing that out! That does make a lot more sense. I guess I hadn’t put two and two together. “…an offshoot of the traditional Catholic Church.” The Orthodox Church and the (Roman) Catholic Church share a 1,000 year old history until 1054 A.D when the local Roman Bishop tried imposing heresies onto the other bishops of the Church, and split from them (hence ROMAN catholic Church). It is biased to say that it is an offshoot of the “traditional Catholic Church”, when the Orthodox have kept the same traditions since Christ and His Apostles started it in 33 A.D.
I’m surprised Colonial Church of Edina didn’t make this list. Admittedly, it’s New England style single level wooden build doesn’t match they type of most of the churches on this list, but it has won 21 architectural awards, even gracing the cover of Church Architechture Magazine when it was still in publication. Heck, it even has a covered bridge, which should count for something! Still, an impressive list and it goes to show how much church buildings have contributed to the architectural history of communities. You know, I actually did consider that one. I used to drive by that one all the time on my way to work when I lived in SLP. I always thought the “moat” around the church was cool! I am considering a follow-up to this list, and will certainly consider it. Thanks for catching that! How easily those two words can get mixed up. Calvary Church is still a Baptist Church. This happened a few years ago when many churches took the denominational name out to encourage more attendance by those afraid of denominational names. Same with Park Avenue Methodist church now known as Park Avenue Church. Park Avenue has a gorgeous sanctuary inside and does not ever get a mention in articles like this. If you ever get around to some sort of follow-up list, I’d strongly recommend Holy Trinity Orthodox Church in St Paul. The exterior is very forgettable but the interior is a trip into another dimension, one where beauty reigns supreme. I’ll have to give that one a look next time I’m down there! The building in which the Church of Scientology resides is actually the old Science Museum of Minnesota. Calvary Baptist was designed by Harry Wild Jones, a member of the congregation, not Warren Hayes. Andrew Carnegie wanted to get the manuscript of “My Country ‘Tis of Thee”, composed by Jones’s great-grandfather and in Jones’ possession. Jones got Carnegie to donate money for the organ, then gave the ms. to Harvard, Smith’s alma mater. Haha. Oops. My bad. Hayes is the architect. Jones did remodeling design. Please delete both of my comments. It is hard to see why St. Paul’s Episcopal Church on-the-Hill, Summit Avenue, St. Paul, isn’t in here somewhere. 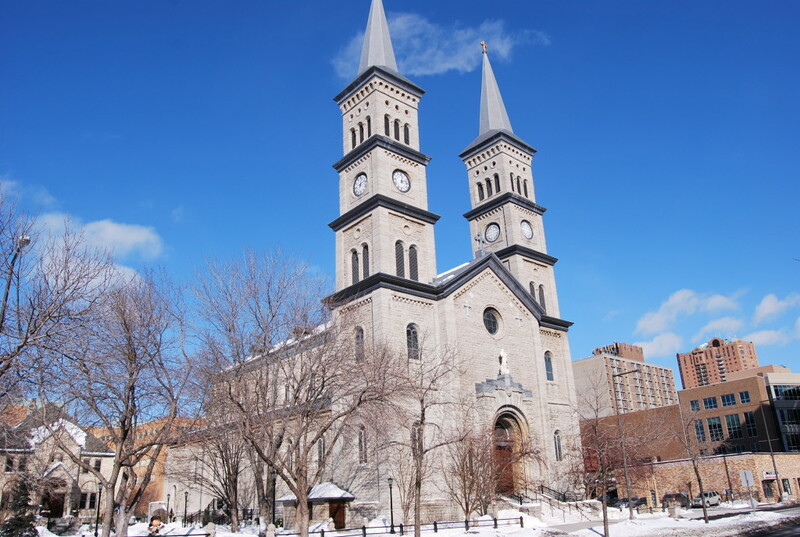 “The 104-year-old Gothic Revival church was designed by Emmanuel Masqueray, who also designed the Basilica of St. Mary and the Cathedral of St. Paul,” both of which are of course here. For picture and additional history see the Villager, 31 Jan 2018, p. 3. #11 Wesley United Methodist Church Building was bought by Substance Church in the Fall of 2018 and they have been holding services there for a couple years now. https://substancechurch.com/downtown. They are in the process of remodeling and updating a few things.